Finding Flow In Swimming | Mediterra - Swim & Run Better Than Ever! One might see it as the experience of moving with no challenge or exertion – where very little is demanded of the body or mind. Or one might see it as the all-out application of effort and force – where too much is demanded of the body and mind. It is found in neither. Rather, we find it in a sweet spot somewhere between those extremes, and that sweet spot is relative to each individual and his own personal conditions. What we need to clarify in that statement is that Flow and Speed are not incompatible, but neither are they equal. Speed is an important servant of Flow, and not a master over it. One could certainly move slowly and achieve a sense of flow from his careful movements and trained attention… if he has created sufficient challenge for his brain in other ways. But I would like to make the case that at each stage of our life and fitness there is a sweet spot to be found in the exposure to challenge through speed, distance and effort that will provide a superior physical and mental experience. One could swim too easy or too hard to reach this optimal state – the trick is to find the zone between those and keep going within it. The great news is that the appropriate speed and effort level for supporting flow is available to each and every person – because that speed or difficulty level is totally relative to your own body and brain, and to no one else’s. An elderly exerciser can tap into flow even without a history of athletics. A former record holding athlete, decades past his prime, can tap into the same kind of flow he had at his peak, even without the same speeds. Flow is not dependent on your past – it is reached only through your present condition and attention. With that said, part of our advanced training for flow state requires you to expand the range of conditions in which you work on entering into flow state. You set up conditions for training that are longer or shorter, faster or slower, rough or smooth, crowded lane or alone, in pool or in open water, etc – use anything that takes you to the edge of your comfort zone in skill. Flow state is not only desirable in a wider range of conditions, it gets easier to slip into when you train for it under a wider range of conditions. 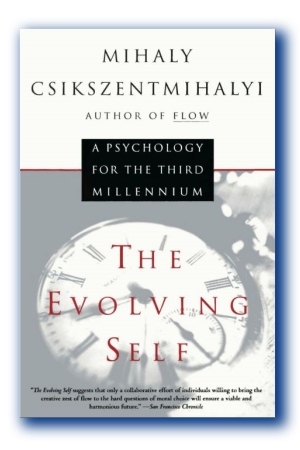 Let’s consider some words from Mihaly Csikszentmihalyi, the famous psychologies who identified and names this concept of Flow and has written extensively on it. Contrary to expectation, “flow” usually happens not during relaxing moments of leisure and entertainment, but rather when we are actively involved in a difficult enterprise, in a task that stretches our physical or mental abilities. Any activity can do it. Notice that flow happens in the context of challenging conditions, not easy ones. The ease of Flow is found through the exercise of working on problems that make you work at the limits of your abilities. It seems a bit contradictory, doesn’t it? Enjoyment emerging from difficulty? It turns out that when challenges are high and personal skills are used to the utmost, we experience this rare state of consciousness. This is why, even if conditions are easy, you set up appropriate self-limiting activities for your practice sets – you intentionally create assignments for yourself which address your weaknesses, provide immediate feedback on your progress, and require full attention. In this way you get lost in the moment, lost in the activity, lost to your own ego – and that state is strongly correlated with feelings of happiness. A happy swimmer is a life-time swimmer! they screen out distractions and make concentration possible. This provides a concise checklist for features you should build into your practice sessions. This approach requires you to have both quantities and qualities assigned in each practice set – you don’t merely finish the distance, you do it with particular standards of quality you must achieve in order to deem it a success. Moments of failure are a sign you are working at the edges of your abilities. The second set of conditions that allows flow to happen is internal to the person. Some people have an uncanny ability to match their skills to the opportunities around them. They set manageable goals for themselves even when there does not seem to be anything for them to do. They are good at reading feedback that others fail to notice. They can concentrate easily and do not get distracted. This speaks to the kaizen mindset – devotion to continual personal improvement no matter the situation. 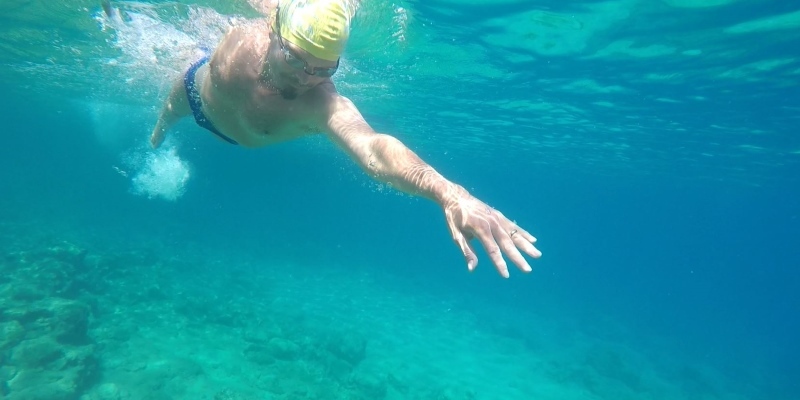 The mindful swimmer is never bored and not easily frustrated by conditions she cannot control because she seeks to create a challenge for her attention and skill in any activity that presents itself. And, her attentiveness notices details and values fine points of feedback because she continually practices mindfulness in her swimming and in her living. She has trained her awareness and attention so it is available for use on demand in situations others consider mundane or boring. Doesn’t that sound like an appealing picture of how to go through daily life, not just in the pool?